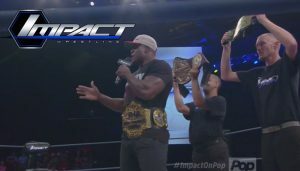 TNA has painted itself into a corner with Lashley holding all the gold. Can they get out of this situation without making someone look bad? Also, has Gail Kim’s quest come to a stupid halt? Aron Rex (formerly Damien Sandow) makes his debut on a show that sees all the singles gold go to one man.